Los Angeles—Anthony Davis scored 32 points and Elfrid Payton finished with a triple double as the New Orleans Pelicans got their NBA season off to a roaring start by clobbering the Houston Rockets 131-112 on Wednesday. Davis also had 16 rebounds and Payton finished with 10 points, 10 rebounds and 10 assists for the Pelicans who led wire-to-wire. 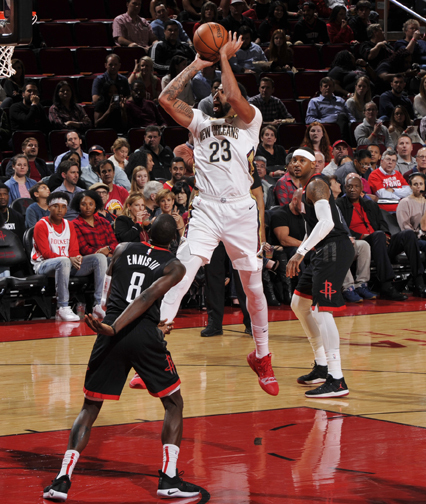 The Pelicans’ dominating win in front of a crowd of 18,000 at Toyota Center arena in Texas was one of 11 games in the first full night of the 2018-19 NBA season. League Most Valuable Player James Harden flirted with a triple double, finishing with 18 points, 10 assists and nine rebounds, but it wasn’t enough as the Rockets failed to match New Orleans’ season-opening intensity, especially on defense. Payton and Julius Randle were the two biggest offseason additions for the Pelicans, who appear to have adjusted nicely to the new blood in the lineup. DeMarcus Cousins and Rajon Rondo are no longer with the Pelicans, who will have to develop a new personality this season. Everybody thought the Pelicans’ 2017-18 season was done when Cousins went down in mid-season with an Achilles injury. New Orleans rallied together and swept Portland in the first round of the playoffs. Rockets coach Mike D’Antoni expected more on opening night from his experienced squad, the most prolific three-point shooting team in the NBA last season when they finished with a franchise record 65-17 win-loss record. They took the NBA by storm last season and many consider them a legitimate threat to dethrone the Golden State Warriors. Chris Paul and PJ Tucker had 19 points each for the Rockets, who are trying to replace outgoing defensive specialists Trevor Ariza and Mbah a Moute with aging veteran Carmelo Anthony and journeyman James Ennis. Reserve Anthony, who bristled in the past about the idea of having to come off the bench, finished with nine points in 27 minutes of playing time. “We didn’t have the legs, we got tired and then started doing things I have never seen us do before. It is the first game of 82. We will right the ship today, tomorrow, and the next day,” said D’Antoni.